Manchester United fans were full of praise for Paul Pogba today after he belittled a Tottenham star in the lead-up to a United goal. Paul Pogba showed incredible strength against Tottenham’s Moussa Dembele in the lead up to Alexis Sanchez’s equaliser. Jose Mourinho’s Man United side had fallen to an early Tottenham lead when Dele Alli latched onto Christian Eriksen’s pass on the 11th minute. However, just thirteen minutes later Alexis Sanchez delivered a heartbreaking equaliser to halt Tottenham’s early celebrations. The goal however came from a magical assist from Paul Pogba. The Frenchman shrugged off Moussa Demebele with ease before delivering a perfect ball for Sanchez to nod home. The style in which Pogba shrugged off the Belgian midfielder provoked a strong reaction from Man United fans. The United number six pushed Dembele to the ground, which prompted an excess of memes from United fans. 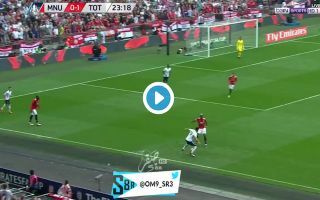 Watch the moment below that Pogba almost single-handeledly destroyed Dembele’s dignity. The way Pogba dropped Dembele ??? United fans were full of praise for Pogba and took to social media to not only commend his assist but also a superb performance from the Frenchman in the FA Cup semi-final at Wembley today. Pogba doing something I’ve never seen before, completely muscling Mousa Dembélé off the ball, cross is fantastic and Alexis Sánchez’ header reminiscent of Lionel Messi beating Vidic and Ferdinand in Rome 2009.